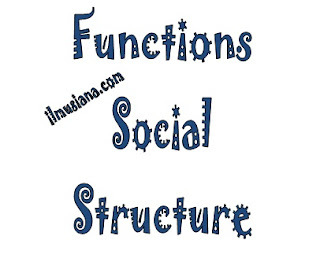 Functions and Forms of Social Structure - Generally, within social structure, there are some social behaviours that tend to remain constant and regular. Those acts are able to serve as delineation of behaviour among individuals and groups. Within a social structure, an individual or group show tendency to adjust their attitude to comply with their respective group or society. Mayor Polak states that social structure can perform duties for social supervisior under which any possibility of breaking the social norms, values, and rules, is oppressed. Social structure can also function as a base to instil social disciplines within group or society. This is possible since social structure origins from the group or society itself. During the process, both individual and group will gain knowledge and awarenes of attitude, habit, as well as trust in the group or society. Peter M. Blau divides the forms of a social structure into two types: an intersected social structure and consilidated social structure. An intersected social structure occurs when memberships of the existing social groups are intersected. In other words, communities whitin the social group have different backround of race, ethnic group, or religion. Consilidated social structure happens when a overlapping measure resulted in a strengthened identity within a social group, during which the group transforms into a vessel for individuals who share common background of race, ethnic group, habit, and beliefs. According to Nasikun, social structure can be perceived both horisontal and vertical. Horisontally, social structure is recognised from is social unity which springs from ethnic group, religion and cultural diversity. Social structure from vertical point of view, on the other hands, is identified from the existing social unity based on different social strata. In many existing literatures, a horisontal social structure is known as social differentiation, whilst a vertical social structure is also identified as social stratification.